Kia Sportage as a premium compact crossover? Why not? If you still think of Kia in terms of its late-1990s offerings, times have changed and Kia has grown up. Sportage is its best-recognized and longest-running nameplate, dating to 1995 when it was the Korean manufacturer's second offering in the North American marketplace. Kia has changed more than a bit since then. The SUV boom was well underway in `95, and the small and inexpensive Sportage offered an alternative to large, expensive SUVs. But then the Sportage was discontinued after 2002. Why? Kia itself was nearly discontinued. A buyout by fellow Korean company Hyundai saved Kia, and after that there was little doubt that the Sportage would return as market research showed that the Sportage name was better-recognized than Kia. And despite platform and technology sharing, hardly unknown in the auto industry today, Kia and Hyundai were and still are differentiated in design, styling, and chassis development and tuning. A second generation of Sportage debuted for 2005, a much more upscale vehicle than the original. It was followed by a third generation in 2011, with further refinement and yet more upscale potential, even including a turbocharged model. That move upwards continues for the fourth generation, an early-release 2017 vehicle. Most apparently, it moves ever further from any hint of truck to a sleeker and even more European and car-like presence than even its immediate forebear. Which shouldn't be that much of a surprise as Kia's president and chief design officer, Peter Schreyer, is German. The fact that a designer is the president is telling -- but there is more to the newest Sportage than identifiable design. What's under the skin is more important than the skin, and what's under the elegant new skin is a stiffer structure with more interior space, improvements in suspension and steering systems, an available first-class all-wheel drive system, and all of the contemporary electronic communications, connectivity, and safety systems either standard or available. Trim levels are far better than "entry-level" LX, well-equipped EX, and premium SX Turbo. LX and EX examples have a 181-horsepower 2.4-liter naturally-aspirated four-cylinder engine for power and should account for the bulk of sales; the SX Turbo gets a 2.0-liter turbocharged four with 240 hp in front-wheel drive form or 237 with all-wheel drive. Both engines utilize direct fuel injection for power with efficiency and all trim levels may be equipped with Magna International's Dynamax™ all-wheel drive system, which features control electronics that allow it to be integrated with the car's engine and transmission management systems for better traction and control and fuel efficiency. Transmission in all is a six-speed torque-converter automatic. My test car for the past week has been a 2017 Kia Sportage SX Turbo. 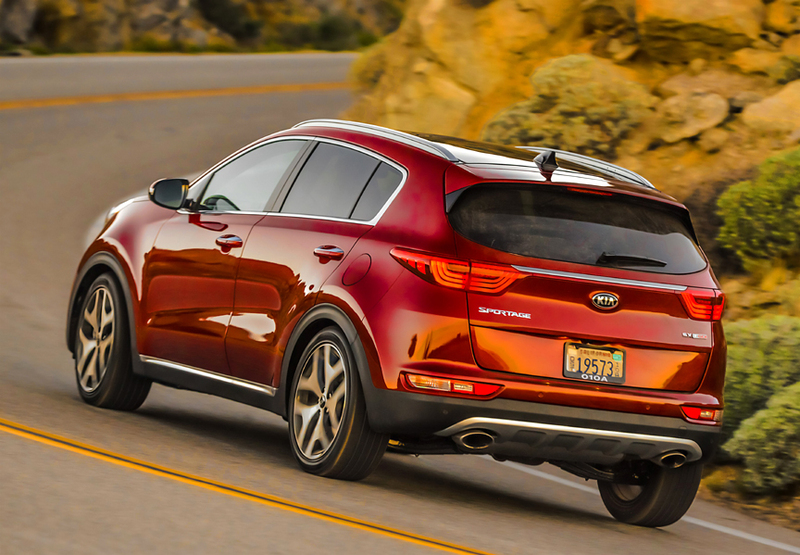 With an MSRP of nearly $35,000, it's an audacious move upscale by Kia, pushing near luxury-brand territory. It meets or beats competitors on power and is comparable in specification -- and with no pricey option packages. Everything that might be optional in lower levels is included, and "everything" here is pretty much everything expected in a premium compact crossover. If you need the badge, you won't consider the Sportage. If you consider the contents, the Sportage is well worth a long look. In SX Turbo trim, it combines style and substance. APPEARANCE: Asian automotive design is usually busy, with an almost-baroque amount of detail. Kia's German design heritage shows best in the new Sportage, and illustrates the evolution of the crossover very well. Truck styling cues are nowhere to be found. In profile, it's a tall five-door hatchback. The only clue to any SUV ancestry is the textured black plastic surrounding the lower perimeter, including the wheel arches. And that's functional -- although the "skid plate" under the front is really for underbody air management, not protection from rocks and tree stumps. Kia' signature "tiger nose" tabbed grille establishes identity at the front, seconded by the reprise of that shape at the top of the windshield. The L-shaped headlights are xenon with "dynamic bending" (meaning they turn a bit to improve night vision) in the SX and projector-beam in lesser models. The SX gets quad LED foglamps per side to the others' singles, and the lower fascia is a bit different. Body lines are restrained, with only the dual bulges in the hood being non-essential. At the rear, the SX gets LED taillights and dual exhausts in a metallic faux skid plate/venturi panel. COMFORT: Walk up to the SX with the fob in your pocket and the mirrors fold out. Touch the door handle to unlock, press the start button to start. As outside, interior styling is simpler than the Asian norm, for an upscale look. Fit and finish is very good. Materials and appointment are upper-middle class, with stitching molded into the soft-touch textured instrument panel top and upper door trim. Perforated leather seating surfaces allow both heat and cooling air through, and the front buckets are power-adjustable. Comfort and support levels are high, and both heat and ventilation were useful in ever-changing Spring weather. Ditto for the heated steering wheel rim, under leather of course. Adjustment for tilt and reach is manual, and controls for audio, phone, and cruise systems are on the spokes. Shift paddles are behind the spokes. The bright TF "Supervision" instrument cluster is exclusive to the SX and easily visible in all light. The SX also gets a larger center touchscreen, with well-marked buttons for control of main infotainment systems -- navigation, audio, and the UVO telematics system. All of the expected audio choices are available, subject to your phone service limitations for streaming. Climate control is via traditional knobs and buttons on the stack. The rear contoured bench offers more than the expected amount of space, helped by contoured front seatbacks. Each section of its 60/40 split back is adjustable for recline is 17 steps. All trim levels have rear HVAC vents. There are useful storage spaces around the cabin, and some storage under the cargo area, above the space-saver spare tire. 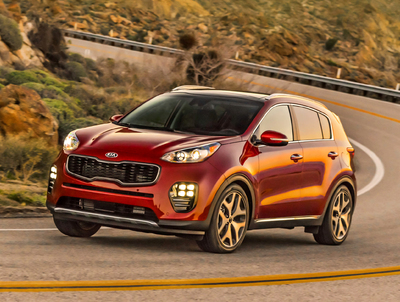 SAFETY: Because of advances in materials and construction of the Sportage's unibody structure, Kia expects it to earn top ratings from both the National Traffic Safety Administration (NHTSA) and the Insurance Institute for Highway Safety (IIHS). Besides the usual safety structures, restraints, airbags, rear camera, and four-wheel antilock disc brakes, traction and stability control systems, and hill-start and downhill-assist systems found in all Sportage trim levels, the SX has standard blind-spot detection with rear cross-traffic alert, autonomous emergency braking with pedestrian detection, land ane-departure warning systems and front and rear sonar parking assist sensors. RIDE AND HANDLING: All 2017 Kia Sportages have a rigid unibody structure that makes extensive use of lightweight steel. Suspension is fully-independent, with MacPherson struts in front and a multi-link system in the rear. The SX gets a firmer tuning than other models, but it's still biased more toward comfort than handling prowess -- perfectly acceptable for its mission in life. It's quiet and composed on the road, even on poor pavement, with good resistance to strong winds. The electrically-assisted steering is not overly-assisted. The brakes work well. The SX is sportier than your average crossover, but not at the expense of passenger comfort. PERFORMANCE: The idea behind a turbocharged four-cylinder engine rather than a V6 is improved fuel economy, with equivalent performance when desired or needed. With 237 horsepower (in AWD trim, 240 FWD) at 6000 rpm and, more importantly for driving, 260 lb-ft of torque between 1450 and 3500 rpm -- the most common rev range -- power for acceleration, merging, or passing is never an issue. When that power is not needed, as in steady-state highway driving, boost levels are lower and fuel consumption less. Direct fuel injection, now used in all Sportage engines, allows a higher compression ratio than otherwise, for improved efficiency -- meaning more power on less fuel, unleaded regular here. The six-speed automatic is programmed for fuel efficiency, so in D sometimes revs are below optimum for quick acceleration. That can be remedied by using "sport" mode or manual over-ride via the shift paddles behind the steering wheel spokes. Once up to speed, "eco" mode helps fuel efficiency. The AWD system is completely transparent in operation. EPA estimates are 20 mpg city and 23 highway. With mostly city and secondary road driving I got 20. CONCLUSIONS: Kia's compact Sportage is less slightly compact and much more stylish. Engine Size 2.0 liters / 122 cu. in. Wheelbase / Length 105.1 in. / 176.4 in.